Two PD positions available for glass research. Applications for postdoctoral fellowships are invited for conducting fundamental and innovative research at the Center for Research, Technology and Education in Vitreous Materials (CeRTEV). 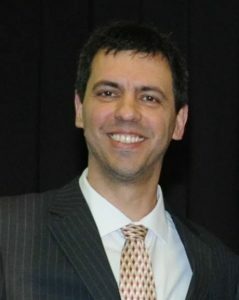 One of the positions is to work at the LEMAF – Laboratory of Spectroscopy of Functional Materials at Physics Institute of USP in São Carlos and the other at the LAVIE – Laboratory of Special Glasses at Chemistry Institute of UNESP, in in Araraquara, Brazil; The period of the fellowship is two years, starting in SeptemberOctober 2019, renewable for two additional years upon mutual consent. CeRTEV is an 11-year (started in 2013) joint effort of the Federal University at São Carlos (UFSCar), the University of São Paulo (USP) and the São Paulo State University (UNESP), to research the area of Functional Glasses and Glass-Ceramics. The post-doctoral research will be focused on fundamental investigations in optical and magnetic glasses with views to innovative applications. Position one will focus on the development (design, synthesis and characterization) of optical glasses for photonic and biophotonic applications among which could be sensing (ionizing radiation, temperature, gas, etc), optical amplifying, lasing, etc. Position two will focus on the synthesis and characterization of different families of glasses and glass-ceramics (oxide, phosphate and fluoride) with magnetic properties. This is a very new field of application for glasses and many opportunities and possibilities are available. Previous experiences with magnetic characterization techniques and/or synthesis of magnetic nanoparticles are also desired. The researcher is expected to conduct the post-doc activities in one of the joint CeRTEV laboratories cited above under supervision ofthe leading Principal Investigator in these labs, but also working in close collaboration with the other CeRTEV researchers and students. Applicants should have a Ph.D. degree in Physics, Chemistry, Materials Science or Engineering (knowledge in electronics and device building is also welcome), previous experience in glass science, solid state physics or chemistry is advantageous. The language requirements are English, Spanish, French or Portuguese. The monthly fellowships (non-taxable) include ca. BRL 7,373,10 -plus 15% professional expenses (e.g., for travel). Our post-docs from Canada, Russia, Iran, India, Colombia, Pakistan and Brazil typically spend from BRL2000 to BRL2500/month for comfortable living style. Travel expenses from and to their home countries will also be covered. XV B-MRS Meeting: message of the chairladies. 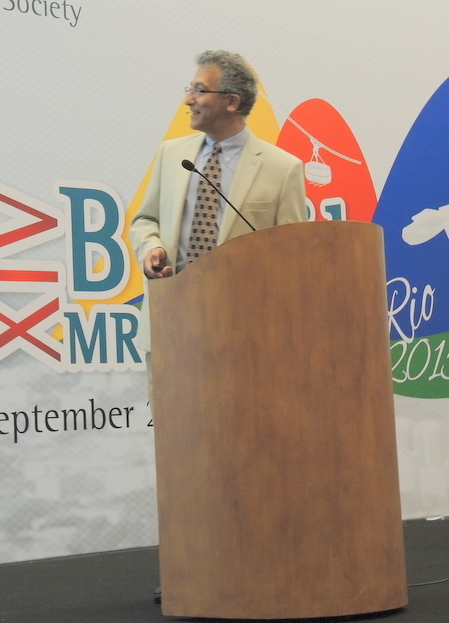 We look forward to your participation at the XV B-MRS meeting, to be held in September, 25-29, in Campinas, São Paulo. 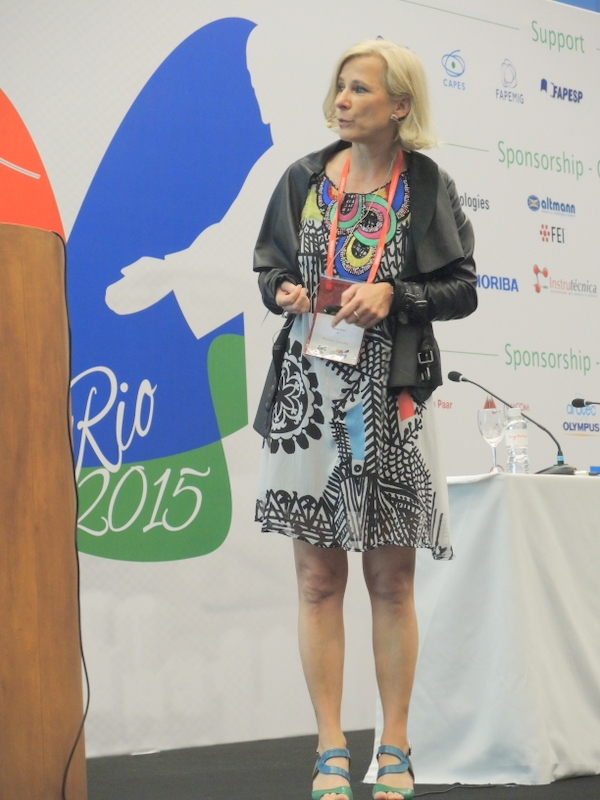 This year the meeting congregates more than 1500 participants, with 2142 accepted abstracts. Fifteen years after the first annual meeting of SBPMat, as it was called then, our figures are impressive, both for the large number of participants and abstracts as well as for the high quality of the scientific contributions, divided in oral and poster presentations. The current edition of the Annual Meeting covers almost all relevant research areas of Materials Science. 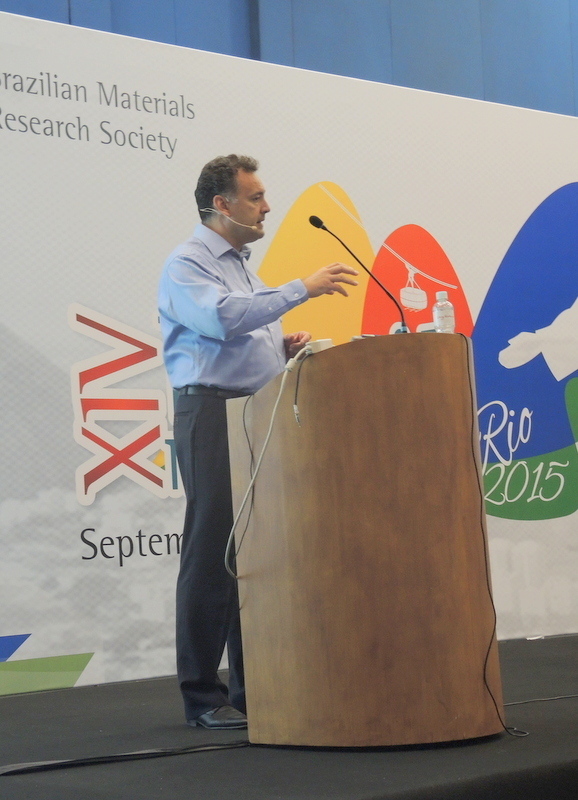 The XV B-MRS Annual Meeting is comprised of 20 Symposia, 2 workshops and 2 Tutorials. The program also includes 7 Plenary Lectures from the most prestigious scientists in cutting edge materials science. The Opening Ceremony will be followed by the Memorial Lecture “Joaquim da Costa Ribeiro”; the renowned scientist Aldo Craievich will talk about the relevance and challenges on advanced materials characterization. Furthermore, in this Meeting program, three discussion panels will take place during lunchtime: Research in Germany, Meet the Editors and Materials Research and Innovation. In particular, the latter will discuss research, development and innovation in industry and the role of innovation agencies and startup ventures. During the Closing Ceremony, the symposium organizers will honor students with the “Bernard Gross Award” for the best poster and best oral presentations of each Symposium. Awards from the European Materials Research Society (E-MRS) and the American Chemical Society (ACS) will be also granted for best posters and oral contributions. On behalf of Organizing Committee, we would like to thank the Brazil-MRS staff and board, the funding agencies, the symposium organizers and the local committee members, for their commitment and great effort to make this Meeting possible. We hope we can all enjoy a very hectic Meeting with stimulating exchange of scientific ideas and results, creating new insights and collaborations, to reach even further quality levels in Materials Science research. Sunday, September 27. By 6:45 pm. 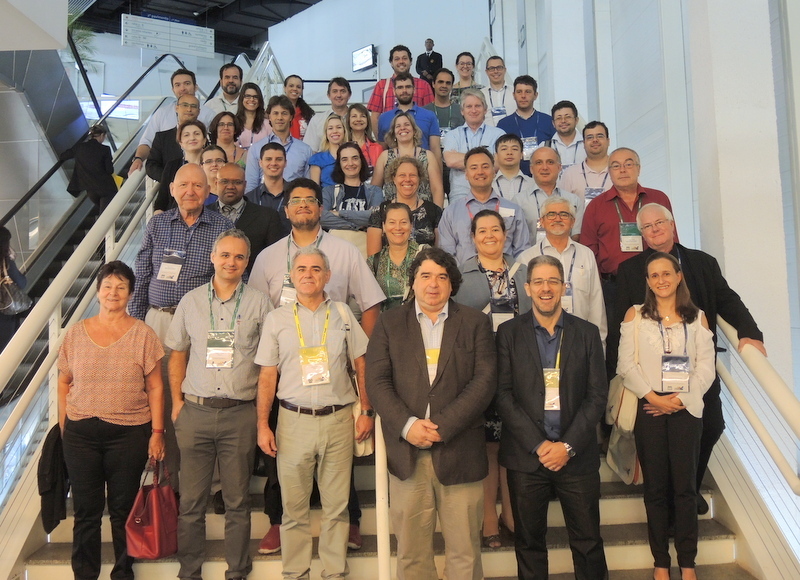 Hundreds of people enter the plenary room of the Convention Center “SulAmérica”, in Rio de Janeiro (Brazil) for the opening ceremony of the 14th annual meeting of the Brazil Materials Research Society, whose acronym in Portuguese is SBPMat. The opening table is composed by the chairmen of the event, Prof. Marco Cremona (Brazil) and Prof. Fernando Lázaro Freire Junior (Brazil), as well as the present SBPMat president, Prof. Roberto Mendonça Faria (Brazil), the immediate past president of the European Materials Research Society (E-MRS), Prof. Rodrigo Martins (Portugal), and the general secretary of the International Union of Materials Research Societies (IUMRS), Prof. Robert Chang (USA). Behind them, a big banner shows the logos of dozens of institutions and companies that gave financial support to the event. At the opening table, from the readers´ left: Prof. Rodrigo Martins (Portugal, E-MRS immediate past president and IUMRS officer), Prof. Fernando Lázaro Freire Junior (Brazil, chair of the event), Prof. Marco Cremona (Brazil, chair of the event), Prof. Roberto Mendonça Faria (Brazil, SBPMat president), and Prof. Robert Chang (USA, IUMRS general secretary). Near 1,000 attendants are present at the ceremony, which starts with the Brazilian national anthem. The chair Prof. Cremona welcomes the participants to the meeting. 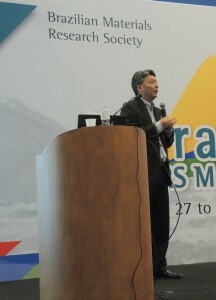 Prof. Robert Chang, who was president of MRS (Materials Research Society) in 1989 and founded IUMRS in 1991, convokes the participants of all countries to try to solve together the most important global challenges for materials research, related to health, food, environment, transport etc. 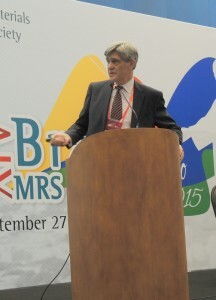 Representing E-MRS, Prof. Martins, who presently takes care of Global Leadership and Service Award at IUMRS, emphasizes his desire of promoting international connections. Prof. Faria talks a little bit about Brazil, which, as well as other developing countries, is very rich in raw materials but needs to add value to its products by means of science and technology. Right after the memorial lecture, in the same venue, the participants enjoy the welcome cocktail while meeting friends and collaborators. The cocktail is animated by live “chorinho” music, an instrumental Brazilian popular genre original from Rio de Janeiro. Monday, September 28. At 8:30 in the morning, the plenary room is full of attendants waiting to learn about metamaterials and the extreme behavior of waves interacting with them in the first plenary lecture of the event. 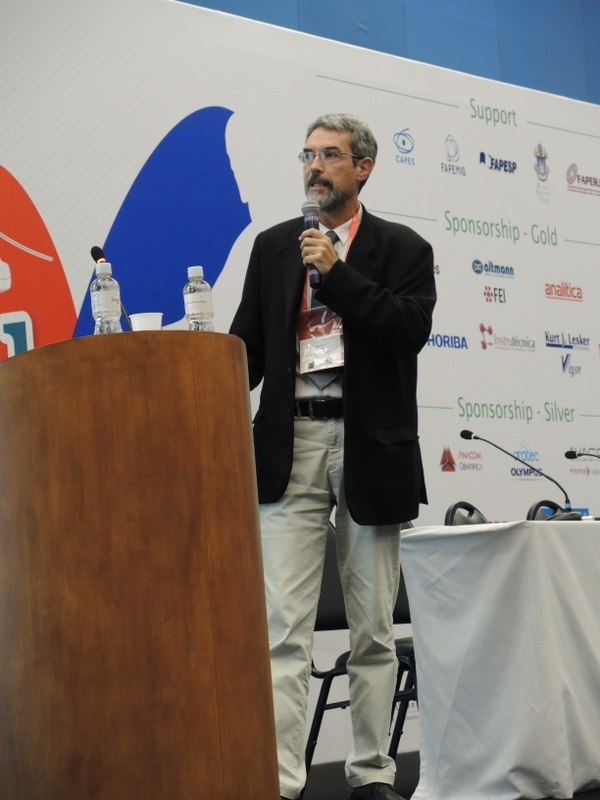 The speaker is Nader Engheta, the H. Nedwill Ramsey Professor of Electrical and Systems Engineering at the University of Pennsylvania (United States). This Iranian-born scientist is a recognized world leader in research on metamaterials, and holds an H number of 69. Through experimental and theoretical research, Engheta and his collaborators have created such unconventional things as nanocircuits made of metamaterials that function as optical filters. Since the beginning of the talk, Engheta captivates the audience with some history of science and with a world of structures created by using particular composite metamaterials with particular sizes and geometries and arranged in particular ways with the aim of obtaining unconventional interaction with light and other waves. In the afternoon, at 3:30, more than 400 people attend the second plenary lecture, which is about glass-ceramics (materials formed through controlled crystallization of certain glasses). The speaker is the Brazilian researcher Edgar Zanotto, Professor at the Federal University of São Carlos (UFSCar), in Brazil, where he founded and heads the Vitreous Materials Laboratory (LaMaV) that assembles a big international team. Zanotto, who is a world-renowned expert on glass-ceramics, presents in his lecture many useful applications of these materials, such as cooking hobs or artificial bones and teeth. He also mentions the scientists who, along 60 years of glass-ceramics history, contributed to the advancement of research on that topic. In spite of those contributions, the comprehension of some aspects of the formation of glass-ceramics is not complete, he says, but that is not a problem for glass-ceramics fabrication and applications. It´s just an opportunity for fundamental scientists. Paul Ducheyne. Biomaterials. Merging Materials Science with Biology. Tuesday, September 29. 8:30 am, time for the third plenary lecture of the event. The lecturer, Prof. Paul Ducheyne, also comes from University of Pennsylvania (USA), where he directs a multidisciplinary center for bioactive materials and tissue engineering research. An authority on biomaterials field, Ducheyne is the editor in chief of a six-volume book on biomaterials published in 2011. In the talk, he shows a series of biomaterial-made devices, grafts, scaffolds etc., most of them already being commercialized, that actively interact with the body, either by promoting tissue formation (for example, bone) or by releasing drugs for diverse treatments. Ducheyne presents their effects on solving health problems, numbers about their markets, and scientific recent advances that can make them even more effective. Ulrike Diebold. Surfaces of Metal Oxides. Some hours later, at 3:30 pm, hundreds of participants cluster again, this time around Prof. Ulrike Diebold, whose research group at UT Wien (Austria) is devoted to the understanding of fundamental mechanisms and processes occurring in surfaces at the atomic scale. 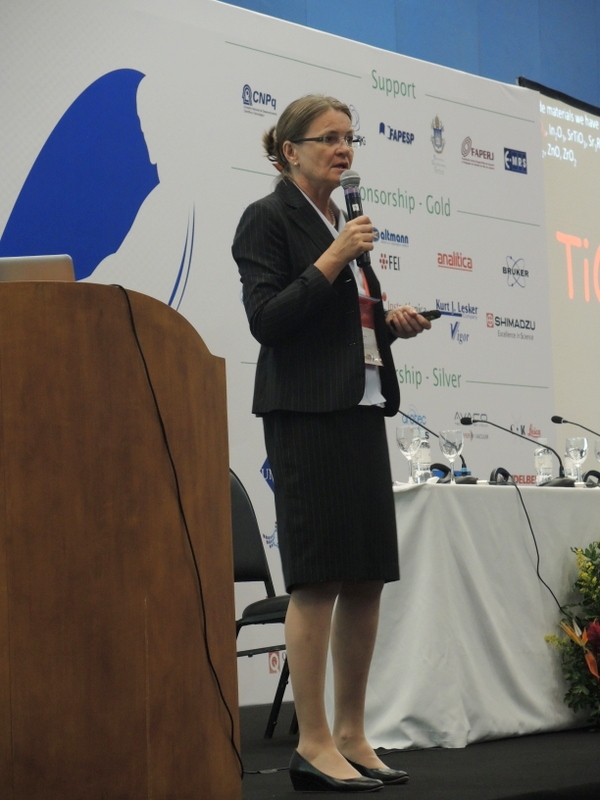 Prof. Diebold catches the audience attention from the beginning to the end by showing, through scanning tunneling microscopy images, how she spies the behavior of atoms on the surface of metal oxides – topic in which she is a worldwide leader researcher. In particular, she reveals two secrets of metal oxide surfaces: the first one about how oxygen adsorbs on titanium dioxide and the second one about how active single metal atoms are in oxidation process in magnetite. Wednesday, September 30. In the plenary lecture of the morning, the audience is transported again to the social-impacting world of biomaterials by Prof. George Malliaras, Greek-born, working at École Nationale Supérieure des Mines de Saint-Étienne (France), where he heads the Department of Bioelectronics. Malliaras has an H index of 64. After many years working on organic electronics, he entered the new field of organic bioelectronics and obtained impacting results. His research is about electronic devices made of conducting polymers that match properties of living tissues. These devices are used for interfacing with human brain – a “natural electronic device”. The final purpose is to study brain activity or diagnose and even treat neurological diseases such as epilepsy. An example of device is a transistor that enables boosted in vivo recording of brain activity with low invasion. As suggestions for the materials community, Malliaras highlights the importance of collaboration with neuroscientists and physicians and the challenge of improving the understanding of electronic transport and structure. Ichiro Takeuchi. Combinatorial Approach to Materials Discovery. In the talk of the afternoon, the speed of science progress accelerates following the beat of the combinatorial approach. Prof. Ichiro Takeuchi, from University of Maryland (USA), explains how his group manages to optimize materials and properties discovery. As well as in lottery one can buy a big number of tickets to have more chances to win a prize, in materials discovery scientists can produce a huge number of combinations of elements to obtain a compound with desirable properties. For example, for quaternary compounds, millions of combinations are possible, from which only 0,01 % are known. In Prof. Takeuchi´s lab, machines for thin film deposition used with masks work night and day to create patchwork-like samples containing libraries of similar compounds. Then, the libraries are characterized by rapid tools, giving information about the properties of several compounds at the same time. Coupled with appropriate theory and computational simulations, these high-throughput experiments become real materials discovery engines. Claudia Draxl. On the Search of Novel Materials: Insight and Discovery though sharing of big data. Thursday, October 1st, 8:30 am. In the last plenary lecture of the event, Prof. Claudia Draxl (Humboldt University, Germany) publicly wonders how to make available the huge amount of data resulting from experiments around the world, high-throughput screening, computer clusters etc. Why to do that with scientific data? For confirmation, broad dissemination in society, sharing with distant collaborators and reuse with new purposes. With that aim, Prof. Draxl and collaborators from European countries are facing the development of a repository of materials raw data, called Novel Materials Discovery (NoMaD), which hosts, organizes and shares materials data on the web. The symposia at SBPMat annual meetings are selected from proposals that can be submitted to the event committee by any scientist from anywhere in the world. 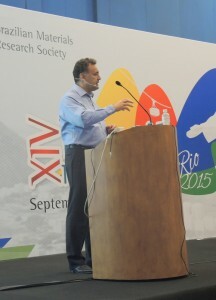 This edition of the event encompassed 26 symposia (including the satellite event “8th International Summit on Organic and Hybrid Solar Cells Stability”) and 2 workshops, and it registered symposia coordinators from Argentina, Denmark, England, France, Germany, Italy, Ireland, Japan, Portugal, Spain, Swiss, USA, and, of course, Brazil. Within the symposia, near 190 invited speeches and more than 2,000 technical works are presented and discussed in oral and posters sessions, on a wide range of subjects going from carbon nanostructures to biomaterials, from characterization techniques to computer simulation, from materials for sustainable development to safe use of nanomaterials. While some symposia have been held year after year in the SBPMat meeting, the University Chapters symposium was a novelty of this year meeting. It was completely organized by students from diverse points of Brazil who are coordinators of the SBPMat University Chapters. The chapters are organized teams, affiliated with the society, composed of graduate and undergraduate students working in materials field. The members of these groups carry out diverse activities that complement their academic education. The students from the existing chapters, which were eight in number up to the moment of the meeting, faced the challenge of organizing a symposium – a task that is usually done by senior researchers. In fact, students have not only active but also massive participation in the XIV SBPMat meeting. Almost half of the attendants (950 people) were master, doctoral and even undergraduate students doing research on materials field. In Brazil, the federal agency for research support, CNPq, has a program called “scientific initiation” that grants scholarships to undergraduate students to conduct research under the supervision of a Professor. For the oral sessions of the symposia, all along the meeting, after the morning plenary session, and before and after the afternoon plenary talks, the attendants distributed themselves among 17 rooms. The poster sessions took place at the end of the afternoon from Monday to Wednesday and in the morning on Thursday. Walking through the long corridors of the poster sessions, one could see active scientific discussion, many times between a young author and a renowned researcher. One could also hear very positive comments about the original arrangement of the poster panels. The size of the poster session was impressive. In total, near 1,800 research works were presented in the posters. View of the first poster session. Twice a day from Monday to Wednesday, the attendants could take a break and have a coffee with cookies while visiting the exhibition of the event, which encompassed 32 stands showing a variety of scientific instruments, services, scientific journals, books and opportunities for the materials community. In addition, on Wednesday, the participants had the opportunity to attend four hours of technical talks given by some expositors about fabrication and characterization techniques. On Thursday by 12:30 the closing ceremony started. In the closing panel, Prof. Soo Wohn Lee, from MRS Korea and conference chair of the IUMRS-ICAM 2015, joined the representatives of SBPMat, E-MRS and IUMRS. The meeting chair Prof. Cremona presented some photos of the past days and hours that made the public remember so nice and fruitful moments. He also presented the numbers of the event: 2,000 registered people from 985 institutions, among which 300 were foreign researchers from 40 countries. Finally, he announced that the next SBPMat annual meeting will be held in Campinas city (São Paulo state). After the closing words, more than 20 prizes were given to young researchers within four different awards: the Bernhard Gross Award, a traditional SBPMat recognition for the best works of students, and the awards bestowed by IUMRS, E-MRS and Horiba. Announcement of the students who won the Bernhard Gross Award. See list of the awards winners.